In rheumatic diseases, autoantibody-producing cells of interest are often hidden in a polyclonal B-lymphocyte population. Immunoglobulin gene fingerprinting is a useful approach to screen for expanding clones and to detect recirculation between different locations. The gene fingerprinting approach and the Southern blot technique have been amalgamated, using electrophoretic transfer of a PCR product from an acrylamide gel onto a nylon membrane followed by hybridization with specific oligonucleotide probes. In contrast to conventional fingerprinting, the authenticity of immunoglobulin genes can be confirmed, individual genes can be detected and handling radionucleotides can be avoided. Also, the membrane may be reused for further investigations. In several rheumatic diseases like rheumatoid arthritis (RA) and systemic lupus erythematosus, B lymphocytes play a major pathogenetic role by the generation of autoantibodies, such as rheumatoid factors and antinuclear antibodies . Several studies of the immunoglobulin gene repertoire have demonstrated an oligoclonal distribution as well as local and systemic clonal expansion of selected B-cell clones as a means of antigen selection in RA [2,3,4,5,6,7]. Recently, Itoh et al. characterized the variable region heavy chain (VH) gene repertoire from peripheral blood, synovial fluid and synovial tissue of a patient with RA, using an immunoglobulin VH gene fingerprinting approach . The distribution of virtually all VH families was oligoclonal. Clonal expansion occurred as a characteristic feature of RA with increasing frequency from the blood to the synovium. VH gene fingerprinting was established for the detection of B-cell clonalities in lymphoproliferative disorders and leukemia [9,10]. This approach allows the detection of predominant clones within a panel of differently rearranged immunoglobulin genes and the identification of clonally-related genes in different samples. The complementarity determining region (CDR)-3 as the site of immunoglobulin gene rearrangement is unique in length for each B-cell clone . By addition of radiolabeled nucleotides to a PCR that amplifies the CDR3-containing immunoglobulin-gene segment and subsequent electrophoresis on an acrylamide sequencing gel, variations in CDR3 lengths of a single nucleotide can be detected. In a polyclonal set of B cells, a wide range of heavy chain CDR3 lengths (5–35 amino acids) occurs, giving a Gaussian distribution with a mean of about 15 amino acids. A change in the appearance of the Gaussian distribution, caused by a dominant nucleotide length, indicates a clonal expansion. Distinct, identical lengths in different samples reveals the presence of clonally-related members that recirculate between different sites. The question remains, however, how to prove that the respective PCR products are truly immunoglobulin genes. In PCR, the risk of artificial amplification increases with the number of cycles and, therefore, control experiments are required. One classical solution is to perform a Southern blot analysis of genomic DNA, but the sensitivity is quite low and only large expanded clones are detected . Sequencing is another option, but it is not easy to isolate the DNA corresponding to the respective bands from the dried acrylamide gel. Reamplification is thus required with a high risk of contamination and Taq-induced mutations. Several modifications of the fingerprinting approach have been performed. The restriction-PCR approach employs two rounds of PCR, interspersed by restriction digestion to further specify the immunoglobulin gene rearrangement . Recently, the heteromobility duplex tracking assay has been applied to the analysis of B-cell clonality using single-stranded, end-labeled, gene-family-specific probes to form heteroduplexes that were separated on acrylamide gels . This approach enables reliable characterization of immunoglobulin gene clonalities. For each sample, however, only a single gene motif can be investigated because the heteroduplex is lost in the gel. To achieve a reliable characterization of clonalities within a set of differently rearranged VH genes, we modified the technique of fingerprinting. The unlabeled, electrophoresed PCR products were blotted onto nylon membranes for Southern hybridization with different oligonucleotide probes. Denaturing acrylamide gels (6%) were loaded with 10 μl of unlabeled VH PCR products and electrophoresis was performed at 50 watts for four hours. Gels were not dried. The DNA was transferred electrophoretically onto a nylon membrane in a semi-dry cell. In our first experiments the membrane was hybridized with a 32P-ATP end-labeled oligonucleotide probe and autoradiography was performed. Later we switched to nonradioactive chemilumiscence end-labeling with identical results. Dried DNA-loaded nylon membranes can be saved and rehybridized several times with different probes after 'stripping' with boiling water. For fingerprinting, we used an oligonucleotide probe that hybridizes to a consensus sequence of the framework region (FR)-3, a conserved motif that is represented in all rearranged heavy chain genes. Subsequently, each rearrangement was detected and an image similar to the fingerprints reported by Itoh et al. was achieved (Fig. 1a). Hybridization to the FR3 oligonucleotide confirmed that the characterized PCR product was a VH gene. A lack of sensitivity for VH2 genes, however, must be taken into account. According to the results of Itoh et al. in our study of ten synovial membranes of patients with RA an oligoclonal distribution of VH genes and the appearance of discrete B-cell clones was seen. We detected a predominance of VH4 genes, and sequence analysis of 14 VH4 genes revealed a biased repertoire containing few germline genes . Southern blots of variable region heavy chain(VH) immunoglogulin gene PCR-products of two synovial membranes and peripheral blood from one patient with rheumatoid arthritis undergoing synovectomies of several finger joints. (a) Framework region (FR)-3 hybridization. (b) and (c) Motif-specific complementarity determining region (CDR)-3 hybridizations. (a) Lanes represent the blotted 350 base pair PCR products in the order of the respective VH family for peripheral blood (B) and two synovial membranes (S1, S2). Distinct VH6 bands of the same height in the FR3 hybridization were thought to represent recirculating, clonally-related genes. This was confirmed by hybridization with motif-specific probes for the respective CDR-3. After 'stripping' with boiling water, the membrane was consecutively rehybridized. (b) Hybridization to the CDR3A-motif occurred at the same height on the VH6-lane of S1 and S2, confirming the presence of the same B-cell clone in both joints (triangle). (c) One VH6 gene from S1 represents the CDR3B-motif (circle). In one patient with RA, the VH genes of two compromised finger joints and of the blood have been compared (Fig. 1). The FR3 hybridization revealed the presence of identical B-cell clones at the different sites that could be confirmed by sequencing . To screen for further clonally-related genes within the compared samples, and to confirm their authenticity, an oligonucleotide probe homologous to the shared CDR3 was synthesized. This probe hybridized specifically at the positions expected (Fig. 1) and proved the identical clonal origin of these genes. No hybridizations to other genes were seen. Particular VH gene segments are known to play a key role in autoimmunity. The VH3 gene, VI.9III, encodes for natural autoantibodies and rheumatoid factors  and the VH1 gene, 51p1, with the light chain kv325, has been described in association with cryoglobulins in cryoglobulinemic vasculitis [18,19]. Suzuki et al. employed probes that were specific for individual VH3 and VH4 motifs in phage libraries and showed a biased repertoire in the peripheral blood of healthy donors . 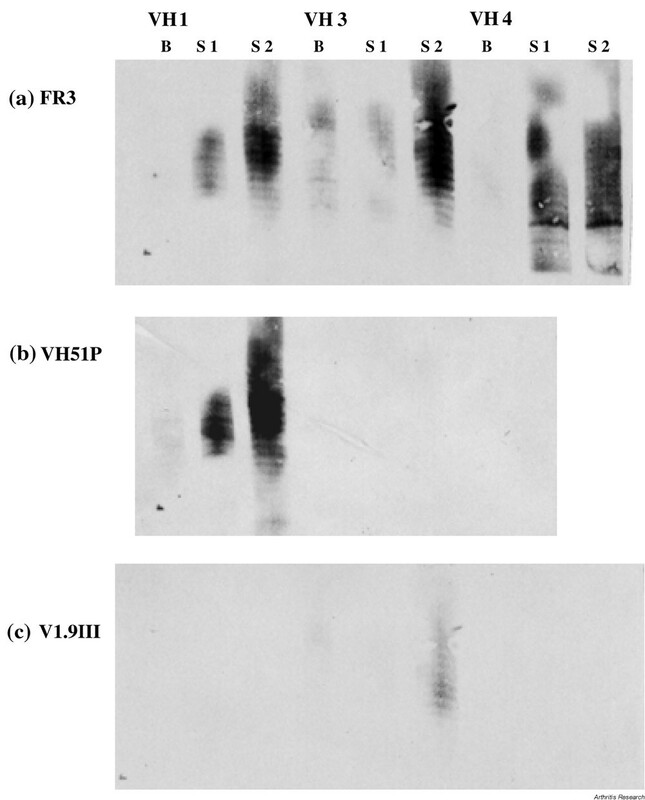 By consecutive hybridizations of membranes containing amplified genes from RA-patients with FR3, VI.9III and VH51P1 gene-specific probes, we could show that these genes were represented by several differently rearranged sequences (Fig. 2). Non-specific hybridizations to genes from other VH families could be eliminated by higher stringency of hybridization and washing conditions. Hybridizations with gene-specific probes of variable region heavy chain (VH) immunoglogulin gene PCR-products from two synovial membranes (S1, S2) and peripheral venous blood (B) from a patient with rheumatoid arthritis undergoing synovectomy of two peripheral joints. Hybridizations were performed, on the same nylon membrane, using chemiluminescence end-labeling, with exposure on film for one hour. (a) Hybridization with a framework region (FR)-3 specific probe. Ladders of bands indicate a polyclonal repertoire of VH1, VH3 and VH4 genes. (b) After 'stripping' with boiling water, the membrane was hybridized to a probe specific to the VH1 gene, VH51P1. Hybridizations occurred with several VH1 genes that represent VH51P1. (c) Hybridization to a VI.9III (VH3)-specific probe. Hybridizations occurred with several VH3-genes that represent VI.9III. VH gene fingerprinting is a useful tool to screen for selected B-cell clones in a large B-lymphocyte population, and to detect clonal relationships at different sites. The modification of the fingerprinting technique, using electrophoretic transfer of DNA onto nylon membranes and hybridization with motif-specific oligonucleotide probes, has confirmed that the respective PCR-products are truly immunoglobulin genes. In this technique, the same membrane can be rehybridized with other oligonucleotide probes for different gene motifs of interest. From the analysis of 10 rheumatoid synovial membranes, we concluded that the different VH families are present in an oligoclonal distribution and that distinct clones could be selected. For one patient with RA, recirculation of members from two VH6-clones could be confirmed by hybridization with oligonucleotides representing the respective CDR3 motifs. Using motif-specific oligonucleotide probes the representation of two autoimmunity-prone genes (VH51P1 and VI.9III) in several RA samples was detected by hybridization. This work was supported by Deutsche Forschungsgemeinschaft Ga 320, 3–1. We thank Mr Guderian (Division of Orthopedics, Rheumaklinik Bad Bramstedt, Germany) for providing synovial tissue samples and Prof Pfreundschuh (Department of Internal Medicine I, Universität-skliniken des Saarlandes, Homburg, Germany) in whose laboratories part of the work was performed.